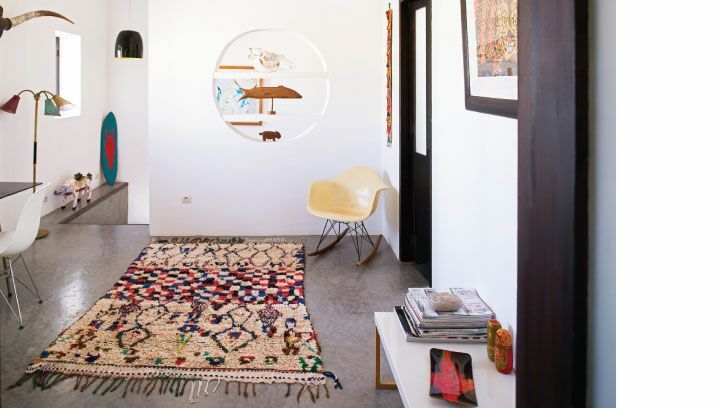 We shopped the souks and curated a beautiful collections of one-of-a-kind rugs to shop from this month. We are offering 30% off the entire rug collection, so it’s time to get busy shopping! Here is a sneak peek of a few of our favorites! Offer ends 2/8/16 – Use code ‘SOUK30’ at checkout! I had never seen (or really noticed) floor pillows until I started Maven. Once my in-country partner sent me that first collection I FELL IN LOVE! 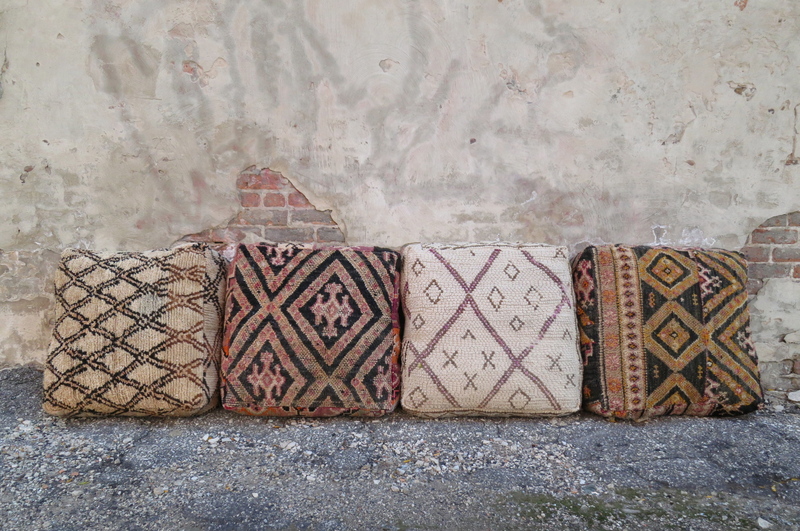 Our rug guys take vintage rugs and cut them up to make these lovely floor cushions. We are digging their latest collection, shop HERE! Sometimes it’s hard to pick a bold pattern for a couch or chair in your living room and that’s where these beauties come into play! They can add so much texture and color to a room. I like to think of them as the chic version of a bean bag chair. Throw pillows, floor pillows, and poufs are such a great way to transform a room and keep transforming it year after year by simply swapping them out as our moods or seasons change:) Check out these beauties below! A sneak peek at our latest fall rugs! Happy Shoppin! We recently shot all of our fall/winter blankets and had to share a few of our favorite photos! We came across a cement wall that worked perfect for the industrial theme we were going for with the shoot. 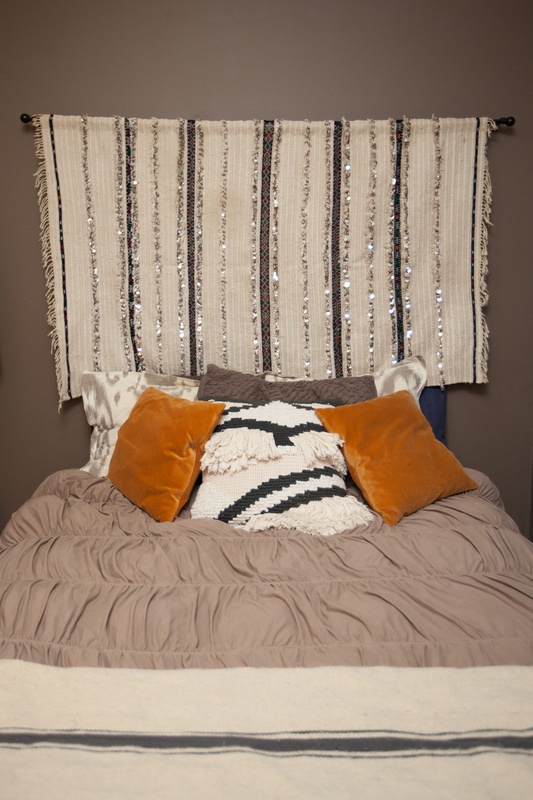 All of the pom pom blankets you see below, are handwoven by our artisan partner in Morocco. You can shop the below collection HERE! Featuring our ‘Dr. Grey’ Pom Pom Blanket, brown leather pouf, and colorful Azilal Runner! Featuring our ‘Souk Shopper’ Basket! Featuring our ‘Dalmatian’ Pom Pom throw! Featuring our ‘Black and White’ Striped Pom Pom blanket! Who doesn’t love a wedding blanket at the end of a bed! 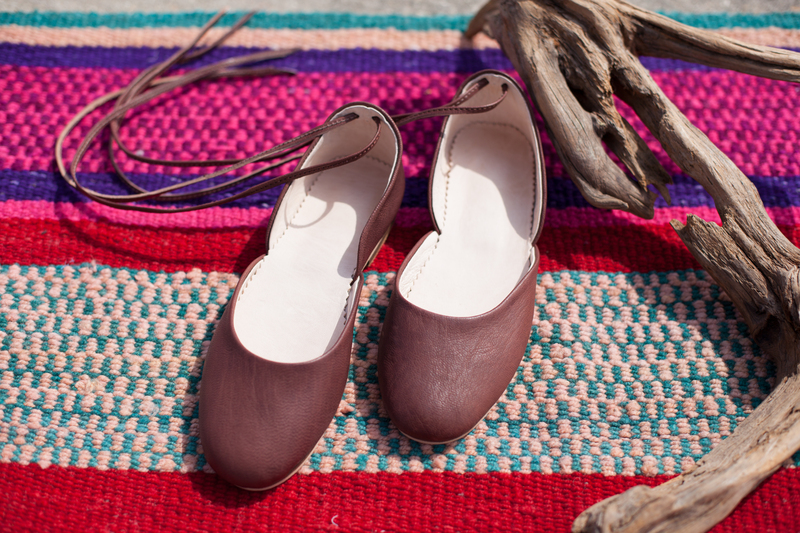 Introducing our ankle tie flats, handmade by our partnering coop in Marrakesh! They come with both black and brown ties, so your can wear them with everything! 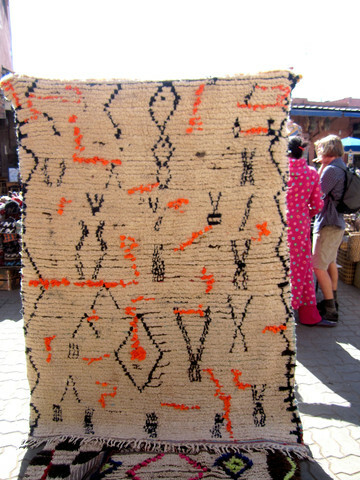 On a recent shopping trip through the souks of Marrakesh, we found this incredible Azilal Rug! 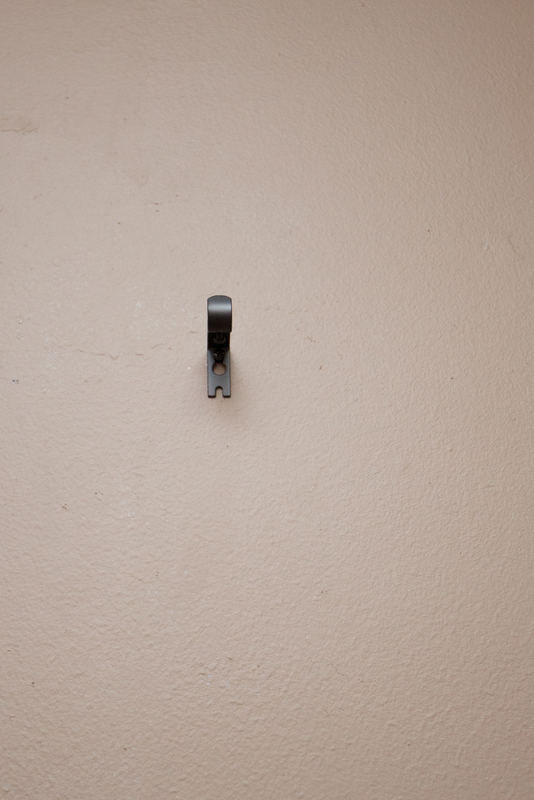 After posting a picture of it on Instagram, Designer Jolene Kraus knew she needed to have it! 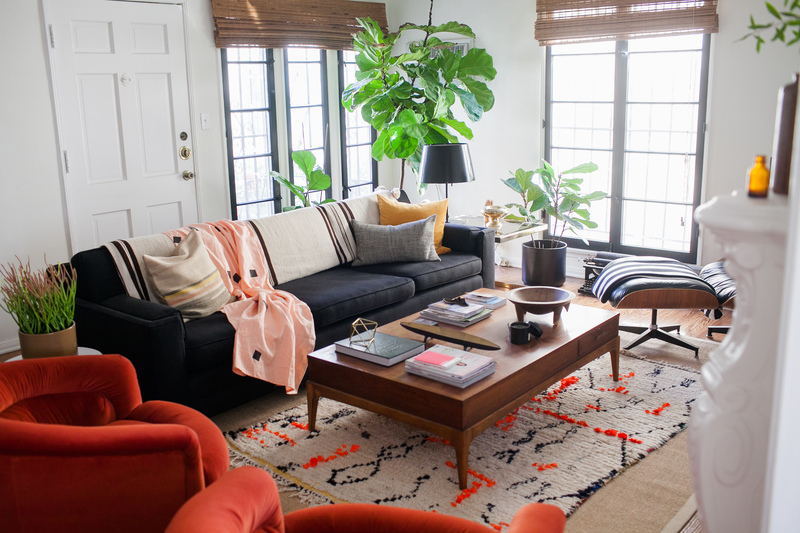 Check out how she styled her living room around this rug, it’s incredibly beautiful! Check out this room! 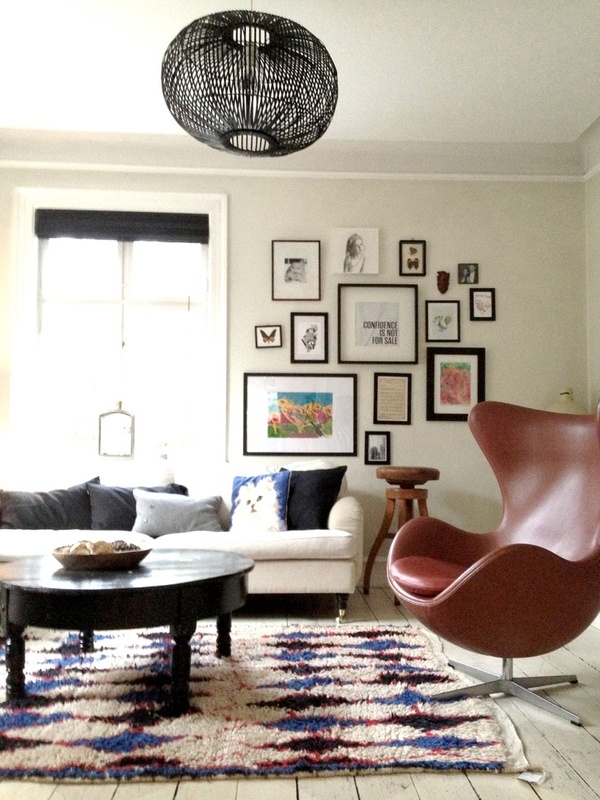 I absolutely love how she placed our azilal rug on an over sized jute rug. The little pops of pale pink plays so nicely with the neon orange. Featuring our cozy comfy floor pillows! Wedding blankets and floor pillows make for the perfect napping corner. If you are ever in Chicago and looking for an event space you must check out By the Barker. Such a lovely loft space on the west side. Area rug in a living room! A lovely seating area.I love how random the lines and color splashes are. 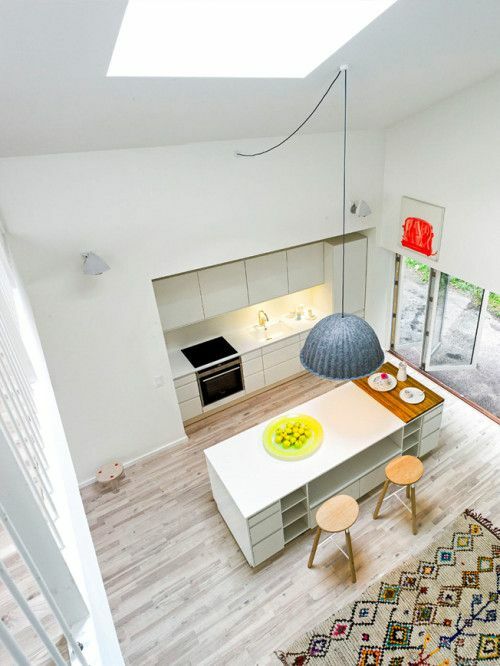 Adding color and texture to an all white kitchen. Perfect for an at home office! 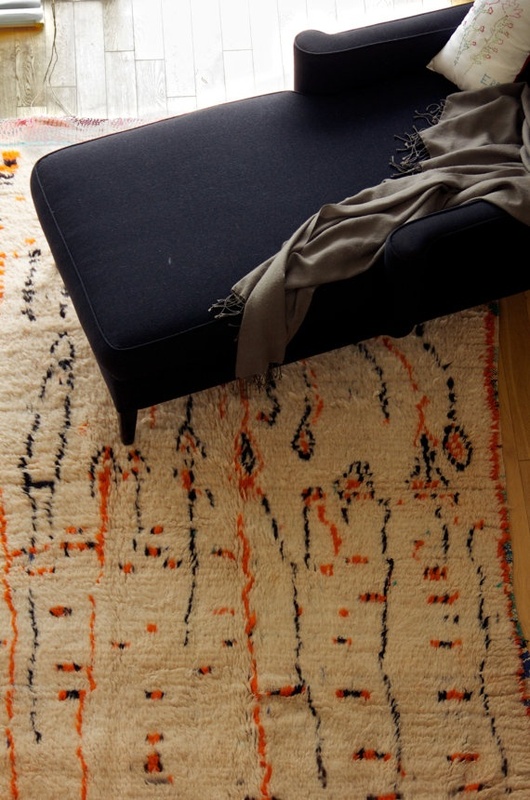 Well, this Azilal rug is just GORGEOUS to begin with. It would look fabulous anywhere but I like it on their cement flooring. 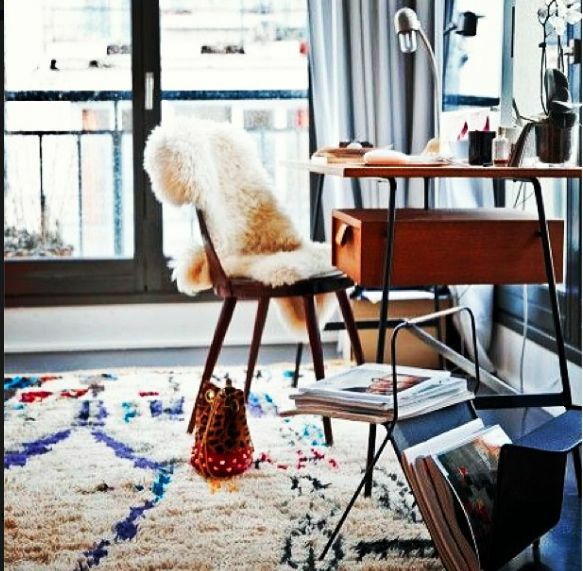 Shop our MAVEN AZILAL RUGS HERE! Our first annual WHITE sale has already been so amazing! 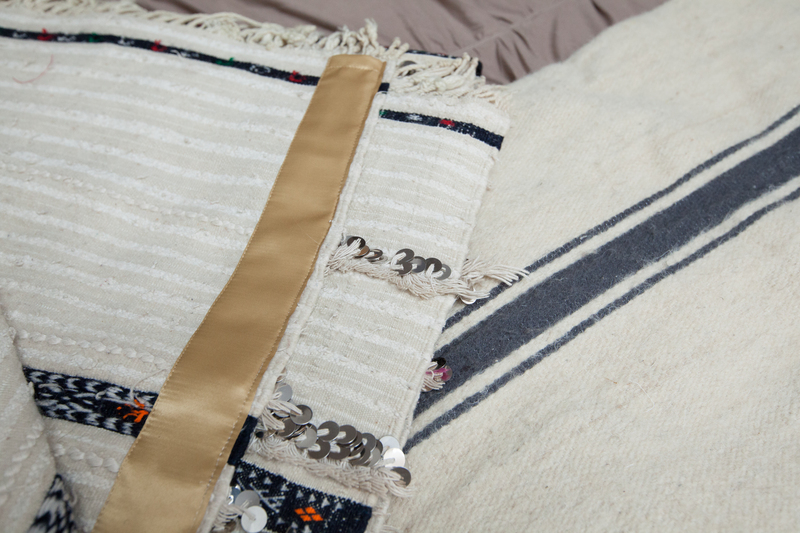 All of our vintage Moroccan Wedding Blankets are on sale for $398!!! There are only a few left, so make sure and shop the sale before it is all picked over. We can not wait to see how all our shoppers style their home with these incredible pieces! 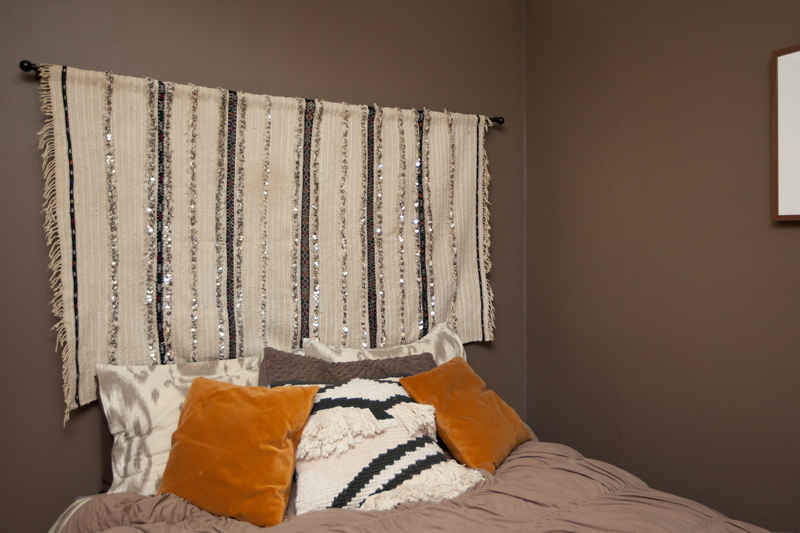 How to hang a Wedding Blanket as a Headboard! We have been asked numerous times, ‘How do I hang a wedding blanket on the wall?’. I had an idea but the biggest obstacle, for me, was how do I attach fabric or anything really to the back of the blanket without ruining such a beautiful piece of art. Now I can’t sew on a button to save my life, so I knew I was going to need to find someone who could help me out! I stopped in my local dry cleaner (who also does alterations) and she told me ‘anything is possible, dear’, so obviously I trusted her with this little project. I told her I planned to hang this blanket on the wall with a rod. She said she would sew on a piece of scrap fabric on the back that the rod could slide into and that she would use invisible thread to attached it so you could not see anything in the front. It turned out perfectly! 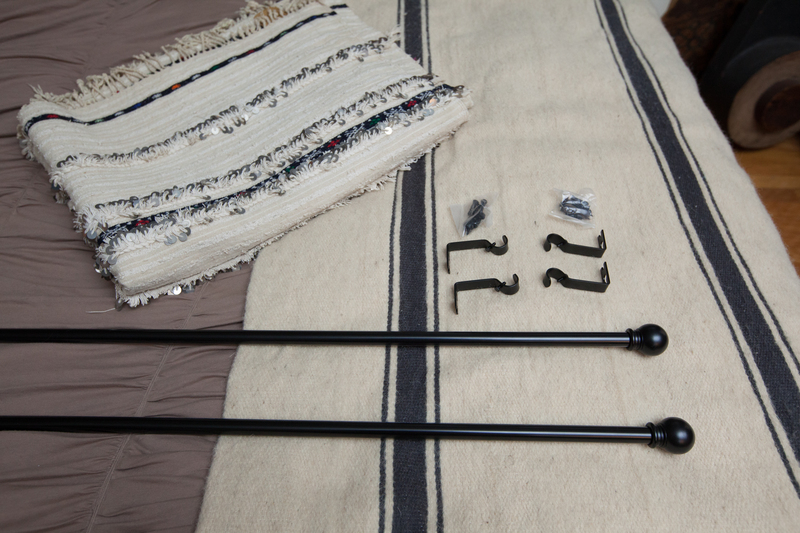 As far as the rod goes, you can go to Target and get the most basic curtain rod, that will do the trick. 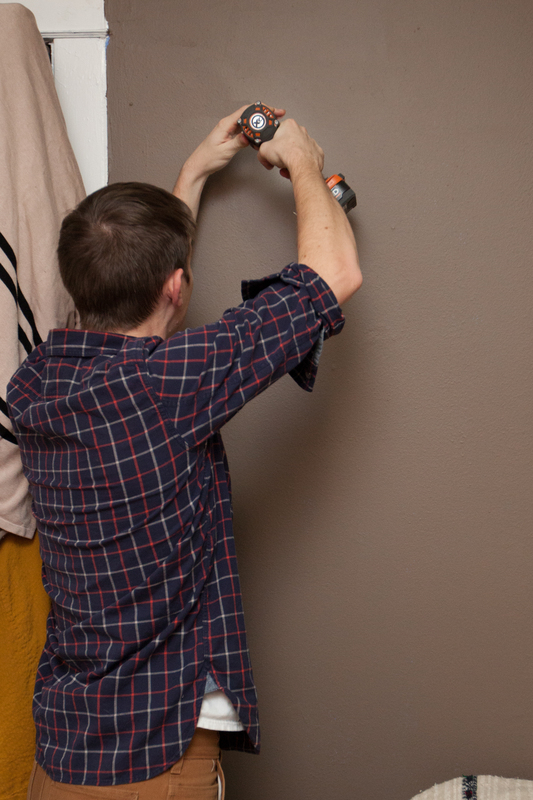 I had my friend Erik help me hang the rod, I’m not so good with the power drill. Thanks for your help Erik, turned out beautifully! Take your wedding blanket to a seamstress or a dry cleaners that does in-house alterations. Ask them to sew on a 2.5” piece of fabric to the back using their invisible thread, you don’t want to see the stitching on the front. This should cost around $40 to have done. Done!!! It make the perfect statement. You can use wedding blankets for headboard, wall hangings, backdrops, etc. The above wedding blanket is for sale and already has the fabric sewn into it. SHOP HERE!